In 1764 Charles Messier, a French astronomer, came across a bright object in the night sky and added it to his catalogue of objects as "M27". However, Messier was looking for comets and so each of his `M´ objects was like searching through a list of items and gradually crossing them off. 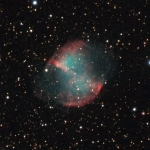 Little did Messier realise that in observing and recording M27 he had discovered the very first planetary nebula. In fact out of a final 110 "Messier Objects" only 4 are planetary nebula: M27 (The Dumbbell Nebula), M57 (The Ring Nebula), M76 (The Little Dumbbell Nebula) and M97 (The Owl Nebula). In contrast our speaker, Owen Brazell, is very interested in this type of nebula as he edits the Webb Society´s journal of "deep sky objects" rather logically entitled "The Deep-Sky Observer". Planetary nebulae are one type of deep sky object in that they are faint objects outside the solar system. None are visible to the naked eye but can be seen using optical aids such as binoculars or a small telescope. It was William Herschel, discoverer of the planet Uranus, who gave them their name, as in small telescopes of the time they resembled the giant planet. His son, who also became an astronomer, observed M27 in 1833 and described it as "a nebula shaped like a dumb-bell, with the elliptic outline completed by a feeble nebulous light." Although they are nothing to do with the gas giant planets, planetary nebulae are somewhat ephemeral. They are a relatively short-lived phenomena compared to the several billion years that their parent star will exist for. The nebula part of their name is due to the glowing shell of gas formed when certain stars are approaching the end of their lives as a production line for turning hydrogen into helium. In another 5 or 6 billion years our own Sun´s hydrogen-fusing stage of life will end and then helium will be used as the building blocks to make carbon and oxygen. As this new process takes place, so the outer layers of the Sun will expand engulfing many of the inner planets. Some of the Sun´s outer layers will even be ejected into space, at a speed of a few kilometres per second, forming strange ghostly shells of nebulous gas. The average size of a planetary nebula is roughly one light-year across with only about a fifth of them being a spherical shape. Because most of the gas in a planetary nebula is ionized (like that in a fluorescent lamp) the nebula´s shape can be influenced by its central star. Perhaps that is why they take on such asymmetrical shapes. There are about 3,000 planetary nebulae in the Milky Way most of which reside in the plane and central bulge of stars but they have been observed in other galaxies using large telescopes. Professional astronomers are interested in studying these objects in order to better understand stars like our own Sun. Their diverse structures and patterns may on one hand prove a challenge to the scientists but on the other hand make them things of beauty in their own right.